Photography is the simplest art form. Taking a photograph does not require strong hands, fine motor control, or years of training. To make a picture, all you need to do is point the camera and press a button. (Sometimes you might also need to adjust a few settings.) But photography is not purely mechanical. You also need to know how to look, where to point the camera, and when to press the button. These acts depend on the eye, mind, and heart. All the great photographers used similar skills and equipment to produce dramatically different bodies of artistic work. This shows how important eye, mind, and heart are in photography. 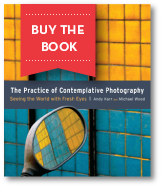 The practice of contemplative photography is an approach to the art of photography that emphasizes developing the ability to see.